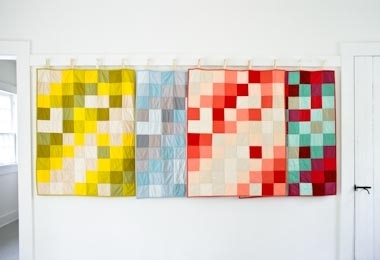 Learn to make an heirloom quilt! Our Learn to Sew a Patchwork Pattern for Beginners walks you through every step of the process, from cutting to quilting. If you know the basics of using your sewing machine, you're ready to get started! This full-color Pattern presents 4 different layout options to sew up a 32 x 40-inch quilt. Choose to receive your Pattern as a PDF download or a hard copy, and for a list of materials you'll need to make your Patchwork Quilt, please click Product Details, above. A 36 x 46-inch piece of 100% cotton batting. We used Quilter's Dream Cotton Batting, Request loft, Craft size. Another option: All of these materials, including the Pattern and excepting the Rotary Cutting Tool Kit, come in our Learn to Sew a Patchwork Quilt Kit.